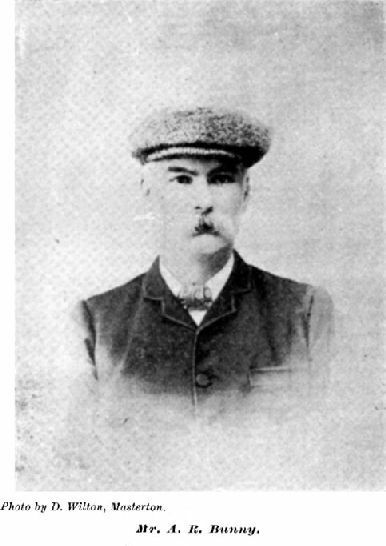 Arthur Bunny was a well-known Masterton lawyer, and son of a prominent early politician Henry Bunny. Arthur Bunny was born in England and came to New Zealand as a child. He trained as a lawyer in Wellington and, once qualified, established a practice in Masterton. He was involved in the Catholic Church and in musical groups in the town.He was an enthusiastic tennis player, his large house in Worksop Road having tennis courts nearby. He was also keen on viticulture and had an extensive vineyard on his property. When he subdivided his land he named one of the streets Bunny Street. Another he named McKenna Street, after his friend and long-serving Catholic priest Monsignor John McKenna. Monsignor McKenna was one of two Irish brothers who served as priests in Wairarapa, and was well-known for his sporting prowess, excelling at both football and tennis. He is credited with playing a large role in bringing the nuns of the Brigidine Order to Masterton. Pic: Arthur Rigby Bunny, Masterton lawyer, who named a street after himself.